Some of the earliest scenes of the princely cycle appear in Iranian ceramics of the late twelfth and early thirteenth centuries before the Mongol invasion, when much of Iran, Central Asia, and Anatolia fell under Seljuq control. The Seljuqs were a Turkic dynasty and followers of the Sunni branch of Islam. Foreigners to Iran and its culture, their rulers sought legitimacy by naming themselves after the legendary Iranian kings lauded in the national epic, the Shāhnāma, and by patronizing art and architectural commissions that celebrated kingship and authority. 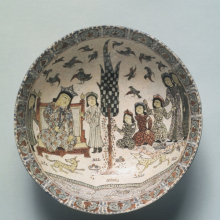 Although few illustrated manuscripts remain from this period, a great number of surviving ceramic wares reveal aspects of courtly life under the Seljuqs, including the one on view. Such minā’ī (enamel) or haft rangi (seven-color) wares comprised some of the earliest examples of polychrome ceramics and represent an expensive and labor-intensive process passed down from one generation of potters to the next. This bowl would have been painted in turquoise, blue, and purple on an opaque white glaze after a first firing; the enamel pigments including black and red, were then added, as well as leaf gilding, and the object would have gone through a second firing at a lower temperature to produce the final product. Kashan has been identified as the main city minā’ī wares were made, although it was probably not the only production site for such pottery. The scene on this bowl is particularly interesting as it is currently the only known enthronement scene that includes children. This is suggested not only by the smaller size of the three figures to the right of the cypress tree, but by a female attendant, possibly the mother, who has one hand behind her child’s shoulder while holding his hand with the other. This painting commemorates the martyrdom of Imam Husayn, the grandson of the prophet Muhammad and the third imam, or leader, of the Shiʿa Muslims. Husayn was killed by the forces of the Umayyad caliph Yazid I (r. 680–683) in the desert of Karbala in central Iraq in 680 C.E. This battle emphasizes the divide between the Sunni and Shiʿa branches of Islam; Husayn led a resistance against what the Shiʿa Muslims believed was the Umayyads’ illegitimate rule. The focus of this painting is Husayn’s half brother, ʿAbbas, mounted on a white horse as he stabs a member of Yazid’s army. Individual episodes related to the agonies suffered by Husayn and his companions leading up to and during the battle are illustrated in smaller-scale vignettes on the left. The hereafter is shown at the right, with Husayn and his companions in heaven above and their opponents in hell below. “Coffeehouse” Paintings Paintings such as Battle of Karbala show how the monumental genre, developed for the Zand and Qajar courts, was reinterpreted for popular audiences during the late nineteenth and early twentieth centuries. This account of Husyan’s martyrdom inspired annual reenactments through ceremonial processions and the taʿziya, the ritual theater of Iran. Narrative paintings served as portable backdrops, or pardas (curtains), that could be rolled up and transported from location to location, where a reciter (pardadār) would point to images as he recounted the story. As they were also presented in coffeehouses, such canvases are commonly referred to as qahvakhāna, or “coffeehouse,” paintings. 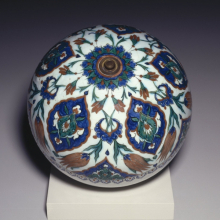 One of the most outstanding examples from the Brooklyn Museum’s fine collection of Islamic ceramics is a large spherical hanging ornament from Ottoman Turkey. The sixteenth century marked the culmination of Ottoman Turkish imperial power and patronage of the arts, particularly under the ruler Süleyman the Magnificent (reigned 1520–66). In the late sixteenth century, Ottoman ceramic production at Iznik (ancient Nicea) reached maturity. Created by the designers of the imperial workshop, or nakkaşhane, the design on this spherical hanging ornament is a harmonious combination of naturalistic floral motifs and stylized vine-scrolls and palmettes characteristic of the late phase of Iznik production (1560–1650). 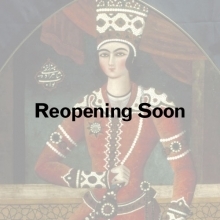 Our galleries for Asian and Islamic art are currently closed for a major construction and reinstallation project and are scheduled to reopen in phases, beginning in 2017. In the meantime, there is a selection of Asian and Islamic objects on view in our Infinite Blue exhibition, on the first floor. The arts of the Islamic world reflect a variety of inspirations and expressions—religious and secular, courtly and popular, urban and nomadic—seen in a wide range of media, including the arts of the book (calligraphy, drawing and painting, illumination, and bookbinding), the portable arts (ceramics, glass, metalwork, woodwork, textiles and carpets, jewelry, ivory, and stone), large-scale painting, architectural elements, photography, and more. Our collection is encyclopedic and demonstrates the aesthetic range and ethnic diversity of Islamic art. The presentation in the galleries, once our renovation is complete, will continue to span a wide geographic area, including Iran, Iraq, Turkey, Egypt, Syria, and Central Asian countries such as Afghanistan, Uzbekistan, and Turkmenistan. In addition to devotional objects, the collection includes ceremonial and household goods, arms and armor, costumes, horse trappings, and jewelry. 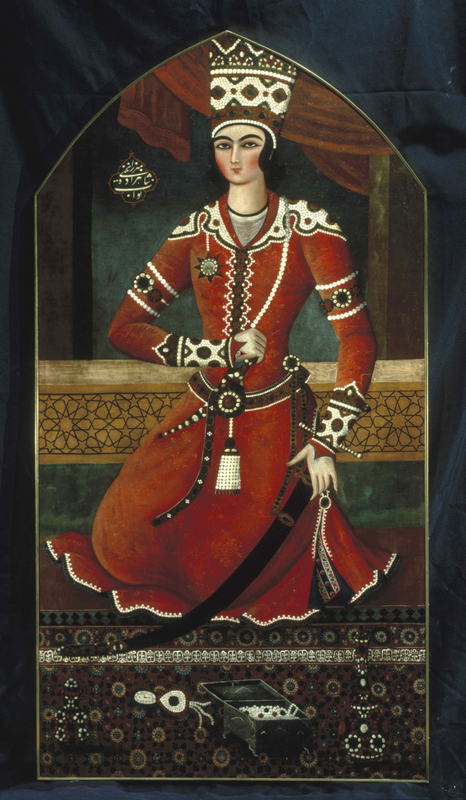 There are works from our renowned, comprehensive group of later Persian art of the Qajar period (1779–1924), which is one of the finest outside Iran. Also well-represented are medieval Islamic ceramics, the arts of Safavid Iran, Ottoman Turkish ceramics and textiles, Turkmen costumes and jewelry, and North African textiles, costumes, and jewelry. 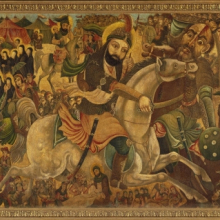 Among the most dramatic works featured in the collection is a large-scale Qajar painting of the legendary Battle of Karbala, which commemorates the martyrdom of Husayn, the grandson of the prophet Muhammad. This work once served as a backdrop for either a processional or theatrical narration of Husayn’s story. Look behind the scenes at the 2009 reinstallation of the Arts of the Islamic World gallery.